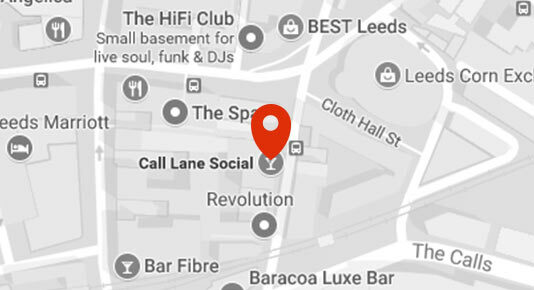 Call Lane Social opened in 2010 and has quickly become a Leeds favourite. Independent, family run bar, we are all about making great drinks and great memories. We know how to throw a party, and you can always expect a warm welcome here at Call Lane Social. Whether for after work drinks or partying 7 nights a week until 4am we are confident you'll find the best atmosphere with us. When you visit make sure you discover our tropical Tiki Hideaway upstairs. Its great for cocktail masterclasses and group bookings. Always upbeat and never pretentious... an effortlessly cool hangout, you can call home. Pop down after work or start early and Roll our Dice to win FREE drinks Sun - Thurs 5-9pm.